In a home loss to surging Wisconsin last night, Iowa again refused to control its own destiny on the way to a Big Ten title. Every time Indiana or Maryland slips up and leaves the Hawkeyes with a big opening, Fran McCaffery’s team just can’t seem to string together a consistent 40 minutes. The loss to the Badgers is Iowa’s third in its last four outings, with the only win coming against cellar-dwelling Minnesota. The perplexing part of the Hawkeyes’ recent slide is that there hasn’t been a clear statistical reason for it — rebounding and turnovers, for example, have been within normal ranges. Rather, a consistent theme in the losses seems to be a relative lack of leadership and a diverse offensive tool kit which doesn’t expand much beyond the three-point shot. Let’s evaluate both of these concerns. Limited offensive game plan. A three-point percentage of 27.8 percent last night from a team that relies so heavily on the three-point shot is a troubling sign, but the bigger concern is limited shot selection from its sharp-shooters, Jared Uthoff and Peter Jok. While Jok prefers to be set up for this threes, Uthoff likes to create his own shot in isolation. Both of these maneuvers have become too predictable. The formula for defensive success here includes initially cutting off the corners and the trailing Hawkeye during transition. Once Iowa settles into the half-court, Mike Gesell usually tries to take his defender off the dribble, but smart defenders give him space to shoot a long two. Gesell is reluctant to shoot the three, so limiting his options to a shot at the top of the key is a much better strategy than letting him draw and dish to Jok or Uthoff in the corners. Putting Uthoff in isolation is another worthy defensive gamble because it typically extends the length of the offensive possession. Iowa’s average offensive possession length is 16.3 seconds, but isolation tends to slow down activity for everyone else without the ball. Uthoff shot a paltry 6-of-23 from beyond the arc during the recent three losses so he needs to be more mindful of defenses challenging him to put the ball on the floor rather than allowing him to line up open jump shots. When the season began, #6 Maryland and #12 Michigan State were seen as the Big Ten favorites. While it is still possible for those squads to take home the conference title, those are not the two teams who sit at 7-0 and atop the current Big Ten standings. #3 Iowa moved its league record to 7-0 this past week with wins over Rutgers and #22 Purdue. The win over the Boilermakers was especially impressive as it clinched a season sweep for the Hawkeyes. It is only late January, yet Iowa already owns season sweeps over both Michigan State and Purdue. #18 Indiana was seen as an afterthought after a tough start to the season, but the Hoosiers haven’t lost since Dec. 2. Tom Crean’s squad moved to 7-0 in the Big Ten this past week with dominating home victories over Illinois and Northwestern. Indiana has a good chance to move its league record to 9-0 this week, as it figures to be solid favorites in a visit to Wisconsin on Tuesday and when Minnesota comes to Bloomington on Saturday. While the hot starts by Iowa and Indiana are certainly noteworthy, we know by now that league titles are not won in January. This week’s Quick N’ Dirty after the jump. With the college basketball season more than halfway over, who knew that the Big Ten would, statistically, be just the fifth highest rated conference in the country (behind even the Pac-12!)? There’s no doubting that it has been a down year for a conference that has arguably been the nation’s best league over the past five years. Seeing the two best teams in the non-conference season (Michigan State and Purdue) already with two league losses isn’t helping. Surpisingly, Iowa and Indiana stand together atop the standings at 4-0 each, but they are coached by Fran McCaffrey and Tom Crean. How long can this really go on? It’s week eight of the Layup Line. They only played one game since last Friday, but the Illini sure made the most of what was a huge game Sunday night against Purdue. They were in control from the start thanks to the Batman-and-Robin duo of Malcolm Hill and Kendrick Nunn. Both juniors continue to have their way with nearly every opponent, but no performance has been as impressive as the one they delivered Sunday. The two combined for 52 points on 17-of-27 shooting and 13-of-17 from the line, while adding 13 rebounds and three blocks. Nunn now leads the Big Ten in scoring (18.8), while Hill ranks third (18.1). Overall, it was a great week for a number of Big Ten point guards, starting with Yogi Ferrell. He continued his brilliant play on Sunday against Ohio State, scoring 16 points and adding six assists, five rebounds and three steals. He’s averaging 19.8 points in Big Ten play and has been tasked, as usual, with guarding the opposing team’s best perimeter player each game. So far, he has lived up to the challenge, slowing down Andrew White, Bronson Koenig and Marc Loving the past three games. Iowa point guard Mike Gesell earned Player of the Week honors after posting his first career double-double (22 points, 10 assists) in a win over Nebraska. He ranks ninth nationally in assists per game (6.9). Bryant McIntosh continued to lead a shorthanded Northwestern group, as he dished out 11 assists at Minnesota and picked apart Wisconsin at home to the tune of 28 points, five assists and four rebounds. He ranks seventh nationally in assists per game (7.1). Melo Trimble struggled in Tuesday’s loss in Ann Arbor, but he did put up 21 points and five assists and hit the game winning three-pointer in Madison on Saturday. Northwestern kept its NCAA Tournament hopes alive last night when the Wildcats edged Wisconsin at home, 70-65, its best win of the season so far. They were led by Bryant McIntosh, who scored 28 points, dished out five assists and is emerging as one of the best guards in the league. The sophomore is averaging 15.4 PPG (10th in B1G) and 7.2 APG (first) this year. As for Northwestern’s at-large prospects, the Wildcats have yet to register a win against another likely NCAA Tournament team, so there’s still work ahead. A win at College Park next Tuesday would be a great place to start. Michigan delivered Maryland its first conference loss of the season when the Wolverines squeaked out a 70-67 victory at home with star Caris Levert still sidelined by a leg injury. Zak Irvin stepped up in Levert’s absence by scoring 22 points on 8-of-14 shooting. This game could represent a season turning point for the Wolverines, a team that had previously been blown out by elite competition. Michigan’s guards were able to stymie the Terrapins’ perimeter offense, as Melo Trimble and Rasheed Sulaimon combined to score only 10 points. If John Beilein can get his guys to play that level of defense for the rest of the season, the 3-1 team will become contenders for a Big Ten championship. On Monday, the Big Ten awarded Iowa‘s Mike Gesell its Player of the Week honors. The senior point guard registered the first double-double of his career in scoring 22 points and dishing 10 assists in a last week’s win over Nebraska. Gesell is playing the best basketball of his life right now — he is averaging 2.5 PPG and 3.0 APG more than last season while also improving his true shooting percentage by 11 percent. There’s no question that Jarrod Uthoff is Iowa’s most important player, but Gesell has emerged as the team’s Robin. Indiana‘s Thomas Bryant was awarded Freshman of the Week for the second time this season after dominating Ohio State’s frontcourt on Sunday — scoring 18 points and grabbing 13 rebounds in the blowout win. Perhaps the biggest improvement the young center has made during the season is with his defense. During Indiana’s loss to Wake Forest at the Maui Invitational, Bryant was consistently exposed on the pick-and-roll by the Demon Deacons’ Devin Thomas. In Big Ten play, the young Hoosier has gotten better off those screens with the proof being his 93.1 defensive rating during conference games. Indiana’s defense, once thought to be a major liability hindering the team’s success, is now being anchored by one of its youngest players. One of the most perplexing results of the season to this point is Purdue’s disappointing Sunday loss to Illinois. 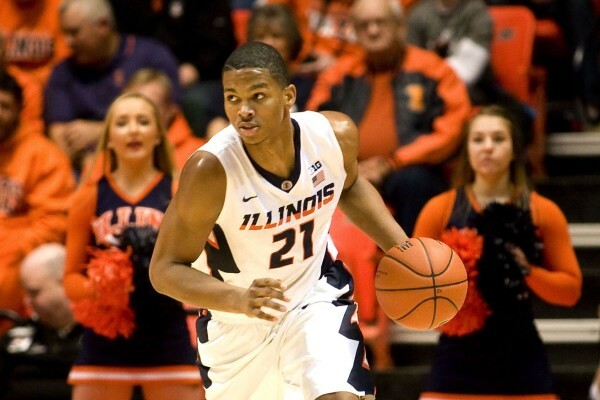 The Boilermakers were not able to take advantage of the Illini’s thin frontcourt and their top-ranked defense allowed Illinois to shoot 52.9 percent from the three-point line. Juan Crespo from SBNation identifies part of the problem, which is that they don’t have a lineup of five players whom Matt Painter can completely trust. Painter may still need to work on different lineups to prevent some of the offensive stalls that still arise too frequently for the Boilermakers. He’ll have a chance to straighten things out on Thursday night against Penn State. Another year of college basketball must mean another mixed start to the season for Iowa. After thumping Marquette on November 19 and moving to 3-0, the Hawkeyes lost two of their next three games during Feast Week and walk into their Big Ten/ACC Challenge tonight sitting at 4-2. But things aren’t all bad for Frank McCaffery as their two losses are to Dayton and Notre Dame, a pair of likely NCAA Tournament teams next March. 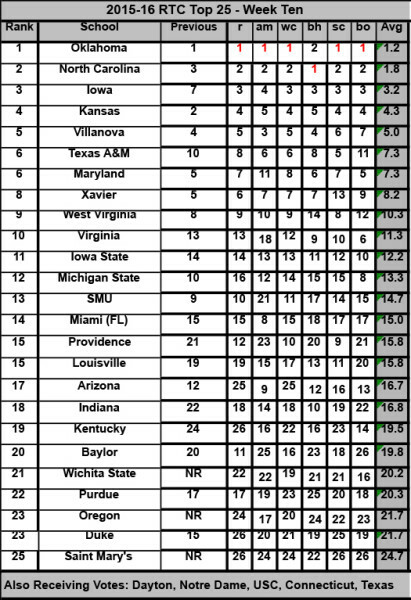 Furthermore, Iowa is currently performing well both on the offensive and defensive ends, ranking #19 and #29 in efficiency on KenPom, respectively. The high offensive rating on offense is especially notable after consecutive years of losing All-Big Ten players like Roy Devyn Marble and Aaron White. In this post, I’ll take a deep look at the Hawkeyes’ offense and see how they’re living up to the two previous seasons. 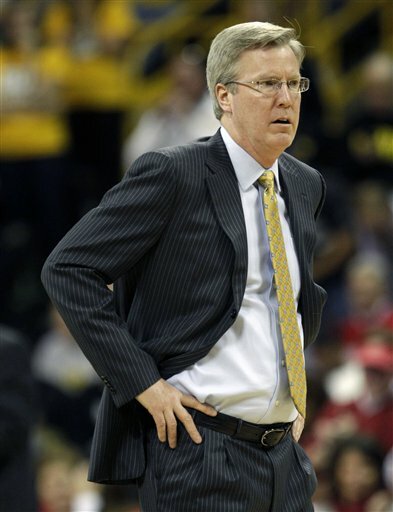 Fran McCaffery built Iowa from Big Ten bottom-feeder into NCAA tournament team in three years. The Hawkeyes have now reached the Big Dance in two straight seasons and blew out Davidson in their most recent appearance. The challenge this winter will be to replace three seniors, most notably first-team all-Big Ten selection Aaron White. Repeating last year’s 12-6 conference record will probably be difficult with White, Josh Oglesby and Gabriel Olaseni all gone. While Iowa may be a notch below a slew of teams with legitimate Big Ten title aspirations, it’s still a threat in the league that shouldn’t be taken lightly. Here’s the recipe for Iowa to reach March Madness without its superstar, White. An experienced, talented frontcourt: White is gone, but Jared Uthoff became a star playing next to him and earned a third-team all-conference selection last year. Now, the former Wisconsin forward is ready to be the go-to scorer. Last season, he shot a higher percentage from three than White (37.2 to White’s 35.6), tied for the team lead in blocks per game (1.6) and turned the ball over a minuscule 10 percent of the time. 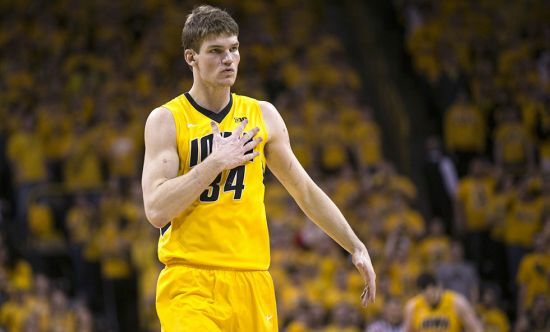 Frontcourt running mate Adam Woodbury may not score a lot, but the 7-footer is a tough defender who cleans up on the glass well (5.2 rebounds per game in just 20.5 minutes in 2014-15). Junior college transfer Dale Jones will provide depth off the bench, filling the role that Olaseni did last season. The regular season is finally complete, and the Big Ten looks to have a solid six NCAA Tournament teams with Indiana and Illinois still with work left to do. With a busy seven-game slate from the weekend to cover, there’s really not else in the form of an introductory paragraph needed. Here is the final Big Ten Weekend in Review of the season. Player of the Weekend: DJ Newbill would get a bunch more recognition if Penn State hadn’t finished the season with just a 4-14 league record. He’s basically put the Nittany Lions on his back for much of the season, and he did so once again as Penn State nipped Minnesota by three. It was looking like it was going to be the Andre Hollins show early on as the Gophers were celebrating Senior Night for the Memphis native and his four fellow seniors. Newbill simply took over the game in the second half, as he scored 2o points in the final 15:01 of the game. He did so in his usual fashion, combining three-point shooting with a kind of old man game which consists of mid-range pull-ups, and drives to the rack. All told, the senior ended up with 31 points on 11-for-22 shooting from the floor. He made five threes, and made all four of his shots at the line. 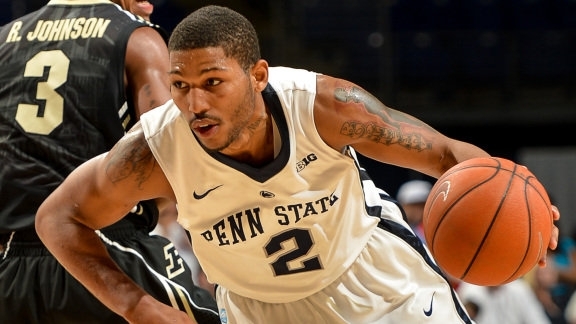 He also led Penn State with four assists and two steals. Another stellar effort from a player who should probably get more love than he does. The weekend before Valentine’s Day in the Big Ten was hardly easy on the eyes. Only five teams were able to crack the the 1.00 points per possession mark, and 10 of the 14 league teams had double-figure turnovers. As an example, Nebraska only managed 13 first half points en route to a 29.4 percent shooting performance in its ugly loss to Penn State. Maryland found itself down by a score of 23-2 to Iowa before finally waking up to make the score a little more respectable (71-55). All in all, it wasn’t a good weekend if you were looking for aesthetically pleasing hoops. As always, though, there were a few highlights and solid performances, so here are some of the best. 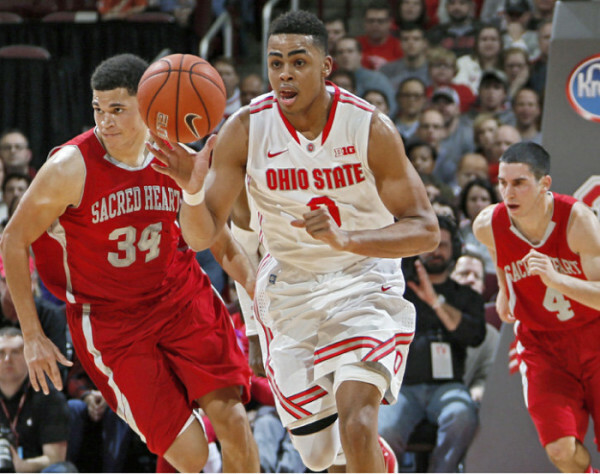 Player of the Weekend: D’Angelo Russell continues to strengthen his candidacies for both Big Ten Player of the Year and National Player of the Year, notching Ohio State’s first triple-double since Evan Turner recorded one in 2010. We can probably just go ahead and make it a post rule that if someone earns a triple-double and his team wins, he will end up with the Player of the Weekend award. Russell didn’t make the handful of spectacular plays that he’s become known for in this game, but he continued to just put up numbers in an efficient way. He scored a ‘quiet’ 23 points, including 17 in the first half on only 13 attempts. He also had six rebounds and seven assists by halftime, making it almost a forgone conclusion that the triple-double was imminent. Granted, all of this production came against Rutgers, but a Player of the Year race that once looked like an easy win for Frank Kaminsky has now become much more competitive. The March 8 tilt between the two stars in Columbus might ultimately decide the award. Super Sub of the Weekend: Ohio State freshmen accounted for 61 of the Buckeyes’ 79 points on Sunday night, and Keita Bates-Diop enjoyed his most productive game of the season. Stepping in because Marc Loving was still suspended, Bates-Diop boosted his confidence by hitting two threes early in the first half. From there, he managed to either tie or post career-bests in all five major statistical categories. He tied a career-high in points (19) and assists (three), and set career-highs with his nine rebounds, two steals and three blocks. Not bad for 19 minutes of action. The Buckeyes are getting great contributions from their freshmen right now, and Thad Matta’s first-year players may decide how far this team goes. In a league defined by chaos this season, last weekend was fairly uneventful and arguably almost normal. There were no upsets, although there were a couple close calls as an undermanned Illinois squad had to sweat it out against Penn State at home, while Rutgers hung with Indiana thanks to the heroics of Myles Mack. Michigan State needed overtime to knock off a gritty Michigan team that once again was without the services of point guard Derrick Walton Jr. Meanwhile, Minnesota avenged an earlier loss to Nebraska by forcing an obscene 20 turnovers and holding the Cornhuskers to just 42 points. It would be obscene not to read the rest of this, so here’s the best and worst of weekend number five in the B1G. Player of the Weekend: Maurice Walker essentially stole Walter Pitchford’s lunch money, gave him a swirly, and then forged a note making fun of the teacher to get him in trouble. Cheesy elementary school metaphors aside, Walker was dominant on the low blocks for Minnesota, scoring at will on his way to a 19-point effort on 7-of-10 shooting from the field. The rest of the Gophers’ offense was nonexistent for most of the contest, so give the guards credit for pounding the ball inside to him. The fifth-year senior also added eight rebounds, two blocks and three steals. 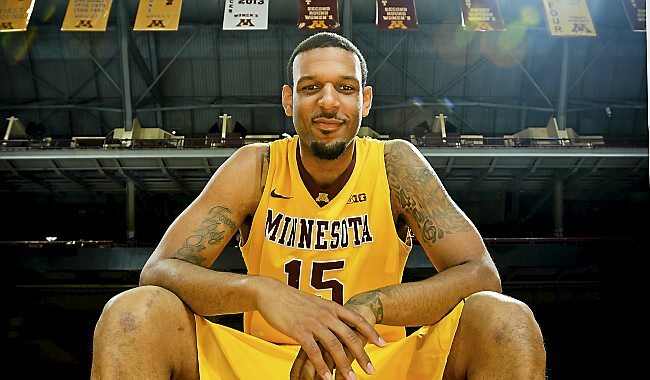 Minnesota is great at taking the ball away ( 14.8% steal rate, third nationally), but Walker is actually fourth in the Big Ten with a steal rate of 3.99 percent. He has really quick hands and does a nice job poking the ball away from post players without fouling. He had three first-half steals in this game as Nebraska coughed the ball up a total of 14 times before halftime. Super Sub of the Weekend: Tom Crean wasn’t happy with the way Indiana had been playing, so he shook things up a bit on Saturday against Rutgers. The change meant that Troy Williams –– despite the fact that he’s had a really good season with some outstanding performances — came off of the bench. He had some silly turnovers but the sophomore also contributed a double-double in the form of 14 points and 10 rebounds. He scored on his usual array of drives and dunks, but one thing slightly unique about this performance was that he was led the break after grabbing a defensive rebound. This led to a faster break out in transition, and it also gave the Hoosiers an ability to have Yogi Ferrell spot up on the perimeter with the rest of the shooters. Don’t expect Williams to become a point forward at Indiana anytime soon, but this was a neat look that takes advantage of Williams’ outstanding ability in the open court while giving Ferrell more looks.